To Cite: Manohar P, Shanthini T, Ekta P, J B M, Muthukaliannan Gothandam K, et al. Colistin-Resistant Klebsiella pneumoniae: Prevalence of Integrons and Synergistic Out Turn for Colistin-Meropenem, Arch Clin Infect Dis. 2018 ; 13(1):e55099. doi: 10.5812/archcid.55099. Background: Klebsiella pneumoniae has the potential to disseminate at speed among the hospital environment, hence included as a major nosocomial pathogen cause of severe infections. This work mainly focused on finding out the prevalence of different classed of integrons in colistin-resistant Klebsiella pneumoniae and to analyze the efficacy of colistin-meropenem in combination. Methods: For this cross-sectional study, random non-biased sampling technique was followed and non-repetitive, Klebsiella pneumoniae clinical isolates were collected (Jan 2015 - Jan 2016) from 2 diagnostic centers located at Chennai and Trichy in Tamil Nadu, India. Isolates were identified as Klebsiella pneumoniae using the VITEK identification system. All the 24 isolates collected were studied for resistance using disk diffusion and minimal inhibitory concentration (MIC). Integrons (class 1, 2, 3) and mcr-1/2 genes were screened for all the isolates. Synergism for colistin-meropenem was tested using checkerboard, time-kill, and modified time-kill analysis. Results: Klebsiella pneumoniae isolates (n = 24) that were resistant to colistin were studied, and MIC50, as well as MIC90 values for colistin, were 64 µg/mL and 16 µg/mL, respectively. Whereas the gene mcr-1/2 was absent in all the isolates tested. Our results revealed the prevalence of class 1 integron among 10/24 isolates (41.6%) and its integron gene cassette in 60% of the isolates with a pattern of variable regions ranging between 700 bp to 2000 bp. The combination of colistin-meropenem implies that by the checkerboard method 86% (21/24) of the isolates, by time-kill analysis 76% (16/21), and by modified time-kill analysis 94% (15/16) of the colistin-resistant isolates showed synergism. Conclusions: This study reveals that the prevalence of integrons might have an impact in spreading colistin resistant Klebsiella pneumoniae among hospital environment, which is a major threat for clinicians. The combination of colistin with meropenem had bactericidal effect against colistin- resistant Klebsiella pneumoniae. The upshot of exorbitant and lavish use of antibiotics leads to antimicrobial resistance (AMR), which is a major hazard to public health globally (1). Hardship in combating resistance is the proliferation of superbugs and the smooth dissemination due to its genetic systems. The transference of resistance chiefly owes to mobile genetic elements like plasmids and transposons (2). The thriving numbers of antibiotic resistant pathogens, which are continually blooming with the hospital-acquired infection, pave a notable trouble on health care systems and in global economic costs. Klebsiella pneumoniae is a Gram-negative, non-motile, encapsulated, lactose fermenting, facultative anaerobe, that belongs to the family of Enterobacteriaceae and it is indexed in “ESKAPE pathogens” by the infectious diseases society of America (3-5). The report from the European antimicrobial resistance surveillance network (EARS- Net) and by Italian nosocomial infections surveillance in intensive care units (SPIN- UTI) networks impart that Klebsiella pneumoniae and Acinetobacter baumannii are a highly predominant bacteria in the intensive care unit (ICU) - acquired infections (6). In order to avoid the emergence of deadly infections in patients, colistin, an abandoned old antibiotic in earlier days for exhibiting neurotoxicity and nephrotoxicity, was replenished for treating against carbapenemase producing Klebsiella pneumoniae and Pseudomonas aeruginosa and other carbapenem- resistant Acinetobacter spp. In virtue of selective pressure, colistin may enact the superbugs to develop resistance towards it (7). Another factor responsible for the dissemination of drug resistant gene is due to its mobile genetic elements namely transposons, integrons, and plasmids. Integration of resistant gene on the plasmid into genetic element called integrons plays a key role in spreading multi-drug resistance in bacteria (8, 9). There are 4 different types of integrons class 1, class 2, class 3, and class 4 of which, class 1 and class 2 integrons are more prevalent in Gram-negative clinical isolates (10). In the hospital sphere, class 1 integrons are robustly aided with multi-drug resistance sighted in Enterobacteriaceae and no data available on the prevalence in the community (11). The report on the newborn plasmid-mediated colistin-resistance gene, mcr-1 in isolates of Escherichia coli and K. pneumoniae arises from animals, raw meat, and humans; later, it has been reported in various countries. It is expected that the dissemination of mcr-1/2 will be rapid since it can be borne on diverse plasmid backbones such as IncI2, IncX4, IncHI2, and IncP. It is necessary to take immediate steps when the patient is detected with colistin resistance infections in clinical settings (12). We are now in a state to prohibit the emergence of future resistance and are made workable with the ease of combination therapy using different classes of antibiotics for the betterment of efficacy (13). In addition, it is necessary to have knowledge in selecting antibiotics with appropriate synergistic activity (14). Combination of colistin with carbapenem is studied in detail to at least save the last resort of available antibiotics. The aim of this study was to find the analysis of the different class of integrons present in colistin-resistant Klebsiella pneumoniae and to exploit the synergistic effect of the colistin-meropenem combination against Klebsiella pneumoniae. The clinical isolates used in this cross-sectional study were collected from diagnostic laboratories located in Chennai and Trichy in Tamil Nadu, India from Jan 2015 to Jan 2016. Following the random non-biased sampling technique, the total of 24 non-repetitive, Klebsiella pneumoniae clinical isolates were collected from 52 samples (patients) and only colistin-resistant isolates were taken for this study (Table 1). For this study, consent was obtained from the diagnostic centers and ethical clearance to study on human samples was received from the institutional ethics committee for human studies (IECH) from VIT University, Vellore. The isolates were received in blood agar plates and were further processed in antibiotic resistance laboratory, VIT University, Vellore, Tamil Nadu. The received isolates were sub-cultured onto brain heart infusion agar (BHI) and stored at -80°C for further studies. Preliminary characterization, based on colony morphology, selective medium - HiCrome Klebsiella selective agar base (Hi-Media, Mumbai) and biochemical characterization was performed. VITEK identification system (bioMerieux, USA) was used for isolate confirmation. Abbreviations:, F, Female; M, Male. MIC for colistin was performed using micro-broth dilution method as explained earlier (15). In brief, cation-adjusted Mueller-Hinton broth (Hi-Media, Mumbai) was sterilized and 100 µL was disbursed to all the 96 wells in a micro-titre plate. Colistin with concentrations ranging from 0.12 µg/mL to 128 µg/mL was made by the serial dilution method and the last column of each well was considered as growth control without the addition of antibiotic. Later, 5 µL of (0.5 McFarland standard) bacterial cultures grown in MH broth was added and micro-titer plates were incubated at 37°C for 16 - 20 hours. The wells with visible growth was considered as resistant and others as susceptible. Colistin resistant breakpoint was considered as > 2 mg/L according to EUCAST guidelines (2015). All the 24 K. pneumoniae isolates were included for the synergy studies. For micro-broth dilution CB MICs, 96-well micro titer plates were used with the standard concentration of each (meropenem + colistin) antibiotic in combination. Standard concentration implies: for colistin 1/16 X MIC to 16 X MIC and for meropenem 1/4 X MIC to 4 X MIC. In plate A, 100 µL of Mueller-Hinton broth (MHB) was added to all the wells leaving the rows A and H empty. Pre-prepared meropenem of 100 µL was added to row G (G1 to G12) and H (H1 to H11; H12 empty) to get a final concentration of 4 MIC. Serial dilution was performed from row G to B. In plate B, 50 µL Mueller-Hinton broth (MHB) was added to all the wells leaving the column 1 and 12 empty. A total of 50 µL colistin was added to column 11 (A11 to H11) and 12 (A12 to G11; G12 empty) to get a final concentration of 16 MIC. Serial dilution was performed from column 11 to 2. Now for combination test, 50 µL from the plate A was dispensed into corresponding wells of plate B. 10 µL of each test organism (5 X 105 CFU/mL) was used. One well with no antibiotic was used as a positive growth control. Test plates were incubated at 37°C in ambient air for 24 hours and read for visible turbidity. Any visible turbidity indicates the growth of the microorganism. Fractional inhibitory concentration (FIC) was calculated using FICA and FICB, by dividing MIC of meropenem in combination by MIC of meropenem alone gives FICA and dividing MIC of colistin in combination by MIC of colistin alone give FICB. FICI values for interpretation was taken as: ≤ 0.5 as synergy, > 0.5 to 1.5 as an additive, > 1.5 to 4 as indifference and > 4 as antagonism. Time-kill analysis was performed with 2 different methods and for the isolates showing either synergistic or additive effect in CB method. In method 1, flasks containing MH broth with respective concentration of antibiotic combinations was inoculated with a test organism of approximately 105 CFU/mL in a final volume of 100 mL and incubated at 37°C in a shaking incubator for 18 hours. After the post- incubation period of 0, 2, 6, 12, and 24 hours, aliquots were removed from the flask, diluted with sterile 0.85% NaCl solution, and plated on MH agar plates for determination of viable counts. After 18 hours of incubation, colonies were counted to determine the synergistic effect of drugs in combination. Synergy was defined as any ≥ 2-log10 decrease in the colony count after 2, 6, 12, or 24 hours comparing with the active single agent. In method 2; small modifications were made to a method explained earlier. The concentrations used were the same as the results obtained from the time-kill analysis. Briefly, tubes containing 1 mL of MH broth was added with respective concentrations of colistin and test organism of approximately 105 CFU/mL and incubated at 37°C in the shaking incubator. At the post-incubation period of 0, 2, 4, and 6 hours, respective concentrations of meropenem were added to each tube irrespective of colistin concentration added earlier. Tubes without antibiotics served as a control. All the tubes were incubated for 18 hours post meropenem addition and synergy was noted. Isolates showing no visible growth were considered as synergy. All the 24 bacterial isolates were subjected to the isolation of DNA using the boiling method (16). In brief, the overnight grown cells were centrifuged at 10,000 rpm for 5 minutes and 100 µL of sterile water was added to the pellet and allowed to boil at 100°C for 10 to15 minutes. Allow it to cool, and spin at 8,000 rpm for 3 minutes. Finally, the supernatant was collected in a separate sterile vial and used as a template for the polymerase chain reaction. To confirm whether K. pneumoniae isolates borne integrons, the existence of class 1, 2, and 3 integrase genes in all the isolates were screened by multiplex polymerase chain reaction (PCR) using the primers intI1, intI2, and intI3 (17). The presence of class 1 integrons was detected by amplifying 5’ CS and 3’ CS along with intI1 were as class 2 integron by the amplification of intI2 using attI2-F and orfX-R for gene cassette characterization. The tube containing reaction volume of 100 µL containing 2 µL of the 0.2 mm dNTPs, 0.4 µL of 0.4 pmol of each primer, 10 µL of 1 X PCR buffer, 0.6 µL of 0.3 U Taq DNA polymerase and 3 µL of template DNA. The amplicons were elucidated by gel electrophoresis on 1.5% W/V agarose gel in TAE buffer. Screening for the presence of the mcr-1 and mcr-2 gene in Klebsiella pneumoniae was performed using primers and conditions explained earlier (18). The primer sequences were CLR5-F 5’-CGGTCAGTCCGTTTGTTC-3’; CLR5-R 5’-CTTGGTCGGTCTGTAGGG-3’ and MCR2-F 5’-TGGTACAGCCCCTTTATT-3’; MCR2-R 5’-GCTTGAGATTGGGTTATGA-3’. A total of 24 isolates used in this study were identified to be Klebsiella pneumoniae using VITEK identification system and were found to be colistin-resistant by disk-diffusion method. In our study, phenotypic determination of colistin resistance by micro-broth dilution results showed that all the 24 isolates were colistin resistant and it was also noted that certain isolates exhibited a higher range of resistance, MIC values > 16 for 13 isolates. The MIC50 and MIC90 values were found to be 64 µg/mL and 16 µg/mL, respectively. Molecular characterization revealed the absence of mcr-1/2 gene among all the 24 isolates for the primers used in this study. In the case of integron prevalent study, all the isolates were subjected to the screening of different class of integrons (class 1, class 2, and class 3). Of the 24 Klebsiella pneumoniae isolates, 10 (41.6%) isolates were identified as being positive for class 1 integron and notably, none of the isolates encoded for class 2 and class 3 integrons for the primers used in this study. Integron cassette region was amplified for all the class 1 integron containing isolates and it occurred in 6 isolates (60%). The pattern of class 1 integron cassette region was 1500 bp (4 isolates), 700 bp + 1500 bp + 2000 bp (1 isolate), and 1500 bp + 2000 bp (1 isolate). The amplification of class 1 integrons among colistin resistant Klebsiella pneumoniae isolates reveals that there is an association with resistance and may expedite the dissipation of resistance in our vicinity. Synergy testing was initially performed for all the 24 K. pneumoniae isolates by CB method. The obtained synergy results were then validated using time-kill analysis and compared with the results of modified time-kill studies. A modified time-kill analysis was performed to confirm the synergetic activity of colistin on test isolates with the addition of meropenem at different time intervals. For checkerboard analysis, Table 2 illustrates the interpretations for the minimum and maximum FICI values for colistin-meropenem. In CB method, of the 24 tested K. pneumoniae isolates, 21 showed additivity or synergism in ≤ 1.5 clear well. Indifference was yielded for the 3 isolates (Table 2). For the 21 isolates that showed synergism or additivity in CB method had FICI of 50% representing synergy/additivity, 17% for additivity, and 21% for additivity/indifference. The data confirmed that the synergism was obtained for 86% of the resistant K. pneumoniae isolates at subinhibitory concentrations of colistin-meropenem. Abbreviations: A, Additivity, I-Indifference; NT, Not Tested; SND, Synergy Not Detected; S, Synergy. aChequerboard synergy testing was performed for all 24 K. pneumoniae isolates with the colistin-meropenem combination. Given the results are the interpretations of the minimum and maximum FICI values. bTime-kill analysis was performed only for the isolates that showed either synergy or additivity with CB testing. Results (in hours) represent the duration for which synergy (S) was obtained. cModified time-kill analysis was performed based on the colistin-meropenem concentrations obtained from the time-kill analysis. The results represent the time (in hours) interval between the initial addition of colistin and meropenem for which synergy (no visible growth) was obtained. dSynergy was not detected at 12 and24 hours. eSynergy was not detected at 24 hours. To validate the synergy results obtained by CB method, the time-kill analysis was performed only for the isolates that depicted synergy/additivity. Time-kill analysis showed synergy for 16/21 isolates, with synergism being obtained at different incubation periods. Synergy was detected at 2 hours in 2 isolates and 14 isolates showed synergism at 12 hours. Figure 1 represents the time-kill synergy study results of colistin in combined with meropenem. Synergy was demonstrated at 6 hours for 7/21 isolates but 2/7 isolates showed synergism only at 6 hours (not at 12 hours and 24 hours). Colistin plus meropenem, at 12 hours, yielded synergy against 14 isolates at subinhibitory concentrations (micrograms per milliliter) of colistin and meropenem. 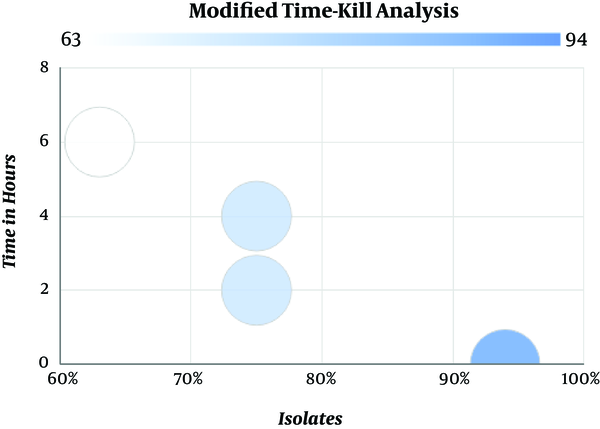 Among 21 isolates tested, 5 isolates showed no synergy (SND) in a time-kill analysis; there were only 5 disagreements between the results of CB and time-kill analysis. None of our results had major category changes like synergy to antagonism. The data represents the percentage of isolates showing the synergistic effect and additive effect at different time intervals. 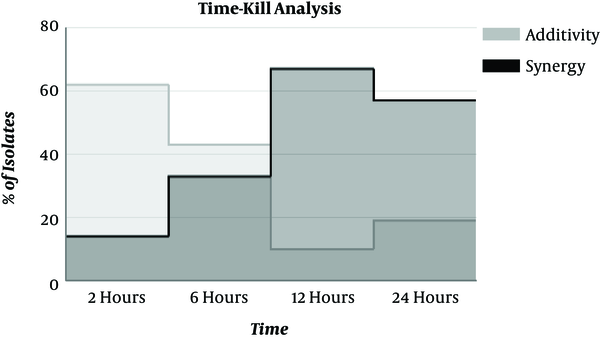 The results obtained from time-kill analysis were further analyzed by modified time-kill studies. Based on the time-kill analysis data, 16 isolates that showed synergy were validated. Modified time-kill analysis showed that 94% (15) of the isolates had no visible growth with colistin and meropenem combination at 0th hours (time interval between the addition of colistin and meropenem). This correlates with the synergy results was obtained in the earlier methods. No visible growth was detected at 6 hours in 63% (10) of the isolates and 75% (12) of the isolates at 2 hours and 4 hours, respectively. Figure 2 represents the modified time-kill study results for synergistic isolates of K. pneumoniae. Only 1 isolate was found to have visible growth at 0 hours to 2 hours post addition of meropenem and no visible growth was found after 4 hours and 6 hours (time interval between the addition of colistin and meropenem). Our data showed that colistin-meropenem combination is working well against colistin resistant Klebsiella pneumoniaein vitro. The bar at the left top represents the lowest (63%) and the right bottom represents the highest (94%) percentage of synergy obtained by modified time-kill studies. Our findings are consistent with our earlier study on the spread of colistin-resistant Gram-negative isolates in Tamil Nadu (15). Phenotypic studies revealed that the isolates (24/24) were resistant to colistin by disk diffusion and micro-broth dilution method. There are reports on the prevalence of colistin-resistant Klebsiella pneumoniae in eastern India (19). In the previous study by Poudyal et al., conducted on 22 multi-drug resistant Klebsiella pneumoniae, of which 6 isolates were colistin resistant with MIC of ≥ 32 µg/mL (20). Another study in Asia, on the emergence of colistin-resistant Klebsiella pneumoniae, reveals that the prevalence rate in Lao PDR and Thailand was 5.8% and 6.6%, respectively (21). In France 2.4% and 0.7% in Nigeria were reported with MICs ranged from 3 mg/L to 64 mg/L (21). The first report on the presence of class 1 integron in multi-drug resistant K. pneumoniae isolates was from the clinical center in northwest Iran (22). A study conducted in the USA reveals that the prevalence of class 1 integron was about 70% in Klebsiella spp. (23), another study which compared the prevalence of class 1 integron among microbiota and clinical isolates imparted that there is no class 1 integrons in the microbiota, whereas in clinical isolates of Klebsiella pneumoniae 47% were with Kp I and 14.3% with Kp III group of class 1 integrons (24). In this study, class 1 integrons (intI1) were amplified in 42% of the isolates and integron gene cassette in 60% of the class 1 integron positive colistin-resistant K. pneumoniae was identified. Considering our results, some isolates, despite being colistin resistant and having integrase gene, did not encode any variable regions (4/10). The presence of integrons in colistin-resistant K. pneumoniae is scary because the acquisition of resistance genes (horizontal gene transfer) is considered to play a major role in the dissemination of resistance properties (17). Prevalence of integrons in colistin-resistant isolates can lead to a serious threat; it may contribute to the spread of resistance as well as it will complicate the treatment of infections in the future (17). Earlier, we reported the prevalence of colistin-resistant isolates (67% of K. pneumoniae) in Tamil Nadu (15), however, to the best of our knowledge, this is the first report on the prevalence of class 1 integrons in colistin-resistant K. pneumoniae in the Southern part of India. The selection of antibiotics colistin-meropenem for the analysis of in vitro combination therapy was based on the phenotypic studies, and chosen antibiotics have differed in mechanism and in the site of action (25, 26). Antibiotic combinations of colistin plus rifampin (23), ertapenem plus doripenem (27), tigecycline plus colistin, fosfomycin plus meropenem, and colistin plus carbapenem (imipenem, meropenem) were extensively studied against colistin resistant Klebsiella pneumoniae. Combinations of colistin-carbapenem or an aminoglycoside, tigecycline, fosfomycin, and rifampin have been advocated for carbapenemase-producing Klebsiella species (28-32). In addition, 3 drug combinations were also assessed to have benefited imipenem plus tigecycline in combination with amikacin showed bactericidal activity (23, 33). Our data showed that the synergistic effect of colistin-meropenem by checkerboard method was 86% (21/24) and by the time-kill studies were 76% (16/21). In modified time-kill analysis, our aim was to expose the isolates initially with colistin and the later addition of meropenem at different time intervals, which allows colistin to disrupt the outer cell membrane making easy permeability of carbapenem (30, 31). Depending on the mechanisms of action, both colistin and meropenem in combination can act as a bactericidal (33, 34). Our data showed that modified time-kill analysis had 94% (15/16) of synergistic activity among results obtained from time-kill analysis. The use of modified time-kill analysis found to be applicable because of the mode of activity of the drugs used in this study. However, there is still a lack of a biological rationale in assessing combination therapy (31, 32). Antibiotic combinations that were shown to have a synergistic activity in vitro should be examined in clinical settings; certain combinations might be antagonistic (31). Though the sample size was low in this study, colistin-resistant K. pneumoniae harbouring class 1 integrons were identified and a combination of colistin with meropenem was found to be a better treatment option for K. pneumoniae infections. Further studies on modified time-kill analysis will provide insight into the exact mechanism of action of the two or more drug in combination (time-interval) and also the future of combination therapy. Our study found the dissemination of class 1 integrons in the colistin-resistant Klebsiella pneumoniae that is a major nosocomial pathogen. The occurrence of class 1 integron together, with resistance in our study, suggests that the more knowledge on integrons may open doors for the screening of colistin resistance in clinical settings. According to our study, colistin-resistant Klebsiella pneumoniae could be combated by combination therapy. In vitro studies on synergistic activity is well studied, however, in vivo studies need to be proven, for that, standardization of synergistic protocol in stand is in need. The authors would like to thank VIT University for providing research facilities. This study was financially supported by DST-SERB, Govt. of India, New Delhi, Ref: No. SERB/LS-930/2012. Funding/Support: This research work was funded by DST-SERB, Govt. of India, New Delhi, Ref: No. SERB/LS-930/2012. 1. European Centre for Disease Prevention and Control . Surveillance of antimicrobial consumption in Europe 2012. Stockholm: ECDC; 2014. 2. Courvalin P. Predictable and unpredictable evolution of antibiotic resistance. J Intern Med. 2008;264(1):4-16. doi: 10.1111/j.1365-2796.2008.01940.x. [PubMed: 18397243]. 3. Rice LB. Federal funding for the study of antimicrobial resistance in nosocomial pathogens: no ESKAPE. J Infect Dis. 2008;197(8):1079-81. doi: 10.1086/533452. [PubMed: 18419525]. 4. Bush K, Jacoby GA. Updated functional classification of beta-lactamases. Antimicrob Agents Chemother. 2010;54(3):969-76. doi: 10.1128/AAC.01009-09. [PubMed: 19995920]. 5. Winn WC. Koneman's color atlas and textbook of diagnostic microbiology. Koneman EW, editor. Lippincott williams & wilkins; 2006. 6. Agodi A, Mura I. The Italian Network SPIN-UTI: Protocol design and validation for active surveillance of ICU-acquired infections. Int J Comp Res. 2011;18(3/4):373-83. 7. Li J, Nation RL, Turnidge JD, Milne RW, Coulthard K, Rayner CR, et al. Colistin: the re-emerging antibiotic for multidrug-resistant Gram-negative bacterial infections. Lancet Infect Dis. 2006;6(9):589-601. doi: 10.1016/S1473-3099(06)70580-1. [PubMed: 16931410]. 8. Leverstein-van Hall MA, M. Blok HE , T. Donders AR , Paauw A, Fluit AC, Verhoef J. Multidrug resistance among Enterobacteriaceae is strongly associated with the presence of integrons and is independent of species or isolate origin. J Infect Dis. 2003;187(2):251-9. doi: 10.1086/345880. [PubMed: 12552449]. 9. Schmitz FJ, Hafner D, Geisel R, Follmann P, Kirschke C, Verhoef J, et al. Increased prevalence of class I integrons in Escherichia coli, Klebsiella species, and Enterobacter species isolates over a 7-year period in a German university hospital. J Clin Microbiol. 2001;39(10):3724-6. doi: 10.1128/JCM.39.10.3724-3726.2001. [PubMed: 11574602]. 10. Salem MM, Muharram M, Alhosiny IM. Distribution of classes 1 and 2 integrons among multi drug resistant E. coli isolated from hospitalized patients with urinary tract infection in Cairo, Egypt. Aust J Basic Appl Sci. 2010;4(3):398-407. 11. Leverstein-Van Hall MA, Paauw A, Box AT, Blok HE, Verhoef J, Fluit AC. Presence of integron-associated resistance in the community is widespread and contributes to multidrug resistance in the hospital. J Clin Microbiol. 2002;40(8):3038-40. doi: 10.1128/JCM.40.8.3038-3040.2002. [PubMed: 12149373]. 12. Nordmann P, Poirel L. Plasmid-mediated colistin resistance: an additional antibiotic resistance menace. Clin Microbiol Infect. 2016;22(5):398-400. doi: 10.1016/j.cmi.2016.03.009. [PubMed: 27021419]. 13. Livermore DM, Warner M, Mushtaq S, Doumith M, Zhang J, Woodford N. What remains against carbapenem-resistant Enterobacteriaceae? Evaluation of chloramphenicol, ciprofloxacin, colistin, fosfomycin, minocycline, nitrofurantoin, temocillin and tigecycline. Int J Antimicrob Agents. 2011;37(5):415-9. doi: 10.1016/j.ijantimicag.2011.01.012. [PubMed: 21429716]. 14. Tascini C, Tagliaferri E, Giani T, Leonildi A, Flammini S, Casini B, et al. Synergistic activity of colistin plus rifampin against colistin-resistant KPC-producing Klebsiella pneumoniae. Antimicrob Agents Chemother. 2013;57(8):3990-3. doi: 10.1128/AAC.00179-13. [PubMed: 23752510]. 15. Ramesh N. Colistin susceptibility of gram-negative clinical isolates from Tamil Nadu, India. Asian Biomed. 2016;10(1):35. doi: 10.5372/1905-7415.1001.462. 16. Yu HS, Lee JC, Kang HY, Ro DW, Chung JY, Jeong YS, et al. Changes in gene cassettes of class 1 integrons among Escherichia coli isolates from urine specimens collected in Korea during the last two decades. J Clin Microbiol. 2003;41(12):5429-33. doi: 10.1128/JCM.41.12.5429-5433.2003. [PubMed: 14662921]. 17. Kargar M, Mohammadalipour Z, Doosti A, Lorzadeh S, Japoni-Nejad A. High Prevalence of Class 1 to 3 Integrons Among Multidrug-Resistant Diarrheagenic Escherichia coli in Southwest of Iran. Osong Public Health Res Perspect. 2014;5(4):193-8. doi: 10.1016/j.phrp.2014.06.003. [PubMed: 25379369]. 18. Xavier BB, Lammens C, Ruhal R, Kumar-Singh S, Butaye P, Goossens H, et al. Identification of a novel plasmid-mediated colistin-resistance gene,mcr-2, inEscherichia coli, Belgium, June 2016. Eurosurveillance. 2016;21(27). doi: 10.2807/1560-7917.es.2016.21.27.30280. 19. Goel G, Hmar L, Sarkar De M, Bhattacharya S, Chandy M. Colistin-resistant Klebsiella pneumoniae: report of a cluster of 24 cases from a new oncology center in eastern India. Infect Control Hosp Epidemiol. 2014;35(8):1076-7. doi: 10.1086/677170. [PubMed: 25026633]. 20. Poudyal A, Howden BP, Bell JM, Gao W, Owen RJ, Turnidge JD, et al. In vitro pharmacodynamics of colistin against multidrug-resistant Klebsiella pneumoniae. J Antimicrob Chemother. 2008;62(6):1311-8. doi: 10.1093/jac/dkn425. [PubMed: 18922815]. 21. Olaitan AO, Diene SM, Kempf M, Berrazeg M, Bakour S, Gupta SK, et al. Worldwide emergence of colistin resistance in Klebsiella pneumoniae from healthy humans and patients in Lao PDR, Thailand, Israel, Nigeria and France owing to inactivation of the PhoP/PhoQ regulator mgrB: an epidemiological and molecular study. Int J Antimicrob Agents. 2014;44(6):500-7. doi: 10.1016/j.ijantimicag.2014.07.020. [PubMed: 25264127]. 22. Ahangarzadeh Rezaee M, Langarizadeh N, Aghazadeh M. First report of class 1 and class 2 integrons in multidrug-resistant Klebsiella pneumoniae isolates from northwest Iran. Jpn J Infect Dis. 2012;65(3):256-9. doi: 10.7883/yoken.65.256. [PubMed: 22627310]. 23. Rao AN, Barlow M, Clark LA, Boring J3, Tenover FC, McGowan JJ. Class 1 integrons in resistant Escherichia coli and Klebsiella spp., US hospitals. Emerg Infect Dis. 2006;12(6):1011-4. [PubMed: 16707065]. 24. Lima AM, de Melo ME, Alves LC, Brayner FA, Lopes AC. Investigation of class 1 integrons in Klebsiella pneumoniae clinical and microbiota isolates belonging to different phylogenetic groups in Recife, State of Pernambuco. Rev Soc Bras Med Trop. 2014;47(2):165-9. doi: 10.1590/0037-8682-0021-2014. [PubMed: 24861289]. 25. Pankuch GA, Lin G, Seifert H, Appelbaum PC. Activity of meropenem with and without ciprofloxacin and colistin against Pseudomonas aeruginosa and Acinetobacter baumannii. Antimicrob Agents Chemother. 2008;52(1):333-6. doi: 10.1128/AAC.00689-07. [PubMed: 17967915]. 26. Sopirala MM, Mangino JE, Gebreyes WA, Biller B, Bannerman T, Balada-Llasat JM, et al. Synergy testing by Etest, microdilution checkerboard, and time-kill methods for pan-drug-resistant Acinetobacter baumannii. Antimicrob Agents Chemother. 2010;54(11):4678-83. doi: 10.1128/AAC.00497-10. [PubMed: 20713678]. 27. Ceccarelli G, Falcone M, Giordano A, Mezzatesta ML, Caio C, Stefani S, et al. Successful ertapenem-doripenem combination treatment of bacteremic ventilator-associated pneumonia due to colistin-resistant KPC-producing Klebsiella pneumoniae. Antimicrob Agents Chemother. 2013;57(6):2900-1. doi: 10.1128/AAC.00188-13. [PubMed: 23571536]. 28. Dickstein Y, Leibovici L, Yahav D, Eliakim-Raz N, Daikos GL, Skiada A, et al. Multicentre open-label randomised controlled trial to compare colistin alone with colistin plus meropenem for the treatment of severe infections caused by carbapenem-resistant Gram-negative infections (AIDA): a study protocol. BMJ Open. 2016;6(4). e009956. doi: 10.1136/bmjopen-2015-009956. [PubMed: 27098822]. 29. Petersen PJ, Labthavikul P, Jones CH, Bradford PA. In vitro antibacterial activities of tigecycline in combination with other antimicrobial agents determined by chequerboard and time-kill kinetic analysis. J Antimicrob Chemother. 2006;57(3):573-6. doi: 10.1093/jac/dki477. [PubMed: 16431863]. 30. Tangden T. Combination antibiotic therapy for multidrug-resistant Gram-negative bacteria. Ups J Med Sci. 2014;119(2):149-53. doi: 10.3109/03009734.2014.899279. [PubMed: 24666223]. 31. Zavascki AP, Bulitta JB, Landersdorfer CB. Combination therapy for carbapenem-resistant Gram-negative bacteria. Expert Rev Anti Infect Ther. 2013;11(12):1333-53. doi: 10.1586/14787210.2013.845523. [PubMed: 24191943]. 32. Zusman O, Avni T, Leibovici L, Adler A, Friberg L, Stergiopoulou T, et al. Systematic review and meta-analysis of in vitro synergy of polymyxins and carbapenems. Antimicrob Agents Chemother. 2013;57(10):5104-11. doi: 10.1128/AAC.01230-13. [PubMed: 23917322]. 33. Mohamed AF, Kristoffersson AN, Karvanen M, Nielsen EI, Cars O, Friberg LE. Dynamic interaction of colistin and meropenem on a WT and a resistant strain of Pseudomonas aeruginosa as quantified in a PK/PD model. J Antimicrob Chemother. 2016;71(5):1279-90. doi: 10.1093/jac/dkv488. [PubMed: 26850719]. 34. Mezzatesta ML, Caio C, Gona F, Zingali T, Salerno I, Stefani S. Colistin Increases the Cidal Activity of Antibiotic Combinations Against Multidrug-Resistant Klebsiella pneumoniae: An In Vitro Model Comparing Multiple Combination Bactericidal Testing at One Peak Serum Concentration and Time-Kill Method. Microb Drug Resist. 2016;22(5):360-3. doi: 10.1089/mdr.2015.0160. [PubMed: 26909754].